"I know the answer to what we all must do. It is to profess love, not hate. To love one another and to love strangers." In a tender message during the 6 p.m. newscast on WDBJ, Hurst spoke of his love for Parker and said "the healing has begun." Hurst and Parker's father Andy were the public faces of the community's mourning in the days immediately following the murders of Parker and her colleague cameraman Adam Ward. An ex-colleague attacked Parker and Ward while they were broadcasting live from a local tourist attraction on August 26. Gunfire was heard on WDBJ's morning newscast and seen, in shocking fashion, when the gunman uploaded his own video of the shooting to social networking sites. 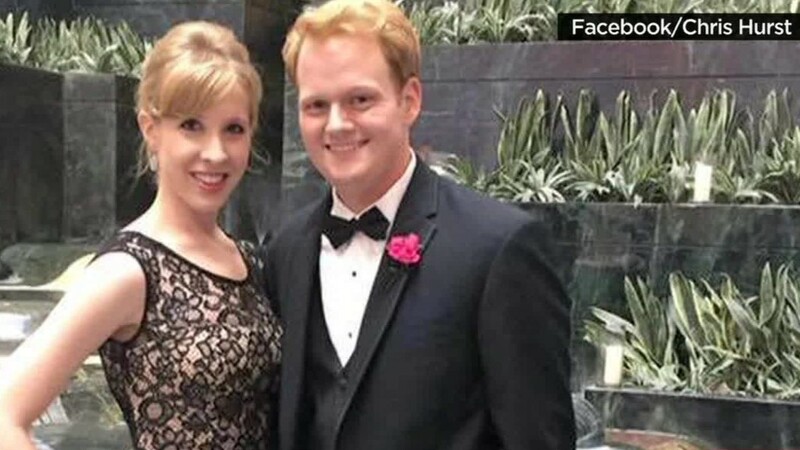 Ward was engaged to Melissa Ott, a producer at WDBJ. And Parker was dating Hurst, a 6 and 11 p.m. anchor at the station. The couple were living together and talking about getting married, but they'd kept the relationship somewhat quiet. The morning of the shooting, Hurst tweeted, "We were together almost nine months. It was the best nine months of our lives." "Alison and Adam projected a love and peace into our world that can never been taken, even if they were taken from us," he said. "She and I fell in love here in the newsroom, as we fondly watched each other care deeply about our communities and try to make them better... and safer. That's what drove her as she came into your home every morning." "Don't forget their love," he added. "It will fuel us the rest of our days." In an interview with me for CNN's "Reliable Sources," Hurst said he felt ready to return to work, partly because Parker loved to see him in his element. "She loved to see me in what she called 'work mode' ... She liked seeing me in that environment," he said. He also said he felt that it was important for viewers -- the ones who tuned in every day and saw Parker in the mornings and him in the evenings -- to see him back behind the anchor desk. Hurst said he's been thinking about the opportunities and responsibilities of the so-called "fourth estate," the news media, to convene conversations about topics like gun violence. He pointedly said he is not supporting any group or position, unlike Parker's father, who is advocating for stricter gun laws. But he said "I do think that we need to have a substantive conversation on violence in general." "Why have we become a violent nation?" he asked rhetorically on "Reliable Sources." While he's steering clear of prescribing solutions, "I can tell you that no one should have to go through the heartache and the anguish of [losing] a loved one in such a sudden fashion. And there is work that journalists can do to investigate and possibly report or expose potential solutions to reduce violence in all of its forms." On his 6 p.m. newscast on Monday, Hurst ended his personal comments by quoting an adaption of the serenity prayer that Parker's mother Barbara had shared with him. "I will always remember to have the serenity to accept the things I cannot change. I have the courage to change the things I can... and the wisdom to MAKE a difference."